Outdoor Fire Features, Great for Cool Nights! As I sit here in my office looking out at the falling snow, I am thinking about how to keep warm on winter nights. Outdoor fire features are a hot trend in landscaping this year (no pun intended, well maybe). Fire features are perfect on a chilly, winter day and create the ideal place to gather with family and friends. There are so many options when it comes to outdoor fire features. We can build anything from a small wood burning fire pit to an elaborate fire table with a dancing flame over colored glass! Whatever you desire, it can be done. Here are a few suggestions of ways to bring a little fire into your backyard landscape. Wood-Burning Fire Features – A permanent wood-burning fire feature can make a great addition to your outdoor living room and are perfect for roasting marshmallows on cool autumn nights. These fire features can be as simple as a fire pit a stone border or as elaborate as a stone mortared fireplace. You can make them as custom as your imagination; just about any shape or size and use a variety of materials - paver, brick, stone, even blue stone. 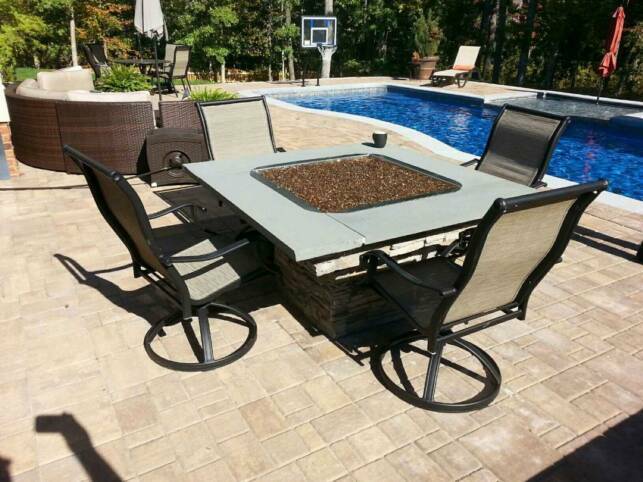 Gas and Propane Fire Pits – If you are tired of chopping wood and want to make your fire feature easier to use, install natural gas or propane as your fuel source. You can add gas to many structures and light it with a flip of the switch. If you are really looking to make a big statement in your landscape, install a dancing flame as a focal point. You can make the flame dance over sand, colored glass or stone. Whatever type fire feature you decide to build this year, remember to keep it safe. Never leave fire unattended and keep flames a good distance from your home. And ALWAYS keep marshmallows on hand!